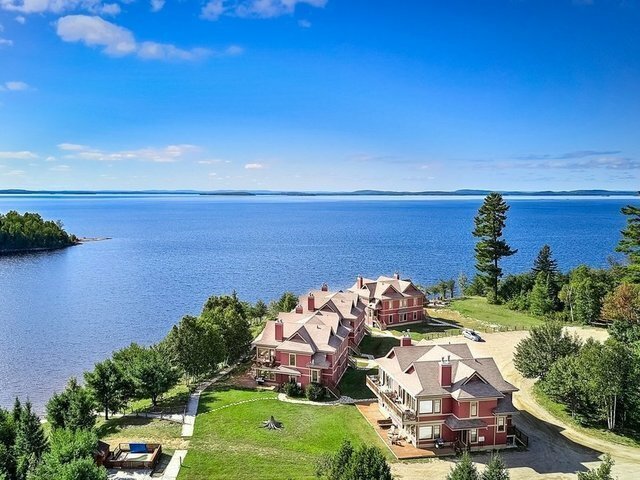 Located in the heart of the majestic nature of the Laurentians, with the Baskatong reservoir as its horizon (a real interior sea with its 420km2 of soft water), the Windigo seduces by the endless opportunities it offers: resort or private club as for varied activities. Its 9 sq km (2260 acres) of wild forest and its 22 km (74,000 linear ft) of shores boast beautiful buildings, cottages, condos, marinas and sandy beaches. Each season gracefully reveals its deepest splendor.The sale includes the restaurant, the reception building, 15 condos, 5 cottages, several lots already divided and undeveloped land, woodland, equipment, etc.Directly on the grounds of Windigo Village or within the Devil Mountain Regional Park, the surrounding nature offers an inexhaustible playground for outdoor enthusiasts.Winter activities: snowmobile (access to 4000km of trails in the Upper Laurentians), quads, snowshoeing, cross-country skiing, skating, etc.Summer activities: canoeing, kayaking, paddle boating, water skiing, wakeboarding, kytesurf, jet ski, sailboat, windsurfing, swimming, fishing (pike, walleye, burbot, sturgeon, freshwater salmon, etc. ), beach, petanque, volleyball, badminton, hebertism track, camping, hiking, etc.A world of adventure awaits!